It’s been around 100,000 years since the Long Valley supervolcano in the US state of California experienced a major eruption, but this supposedly dormant caldera has been acting a bit strangely over the past four decades. New research suggests 240 cubic miles of magma still exists within this supervolcano, but thankfully, a major eruption remains unlikely. The Long Valley Caldera, located near Mammoth Mountain in eastern California, has been quiet for millennia, but its history is one of tremendous violence. Around 760,000 years ago, this supervolcano experienced a colossal six-day eruption that sent lava flows 30 miles (50 km) away and falling ash as far as the midwestern US. The collapse of this volcano’s magma chamber resulted in the formation of the Long Valley Caldera, which experienced many subsequent eruptions during the following years, but nothing major for the past 100,000 years; a volcano forms a depression, called a caldera, after ejecting the majority of its magmatic material. Today, this dormant volcano features a bowl-shaped caldera about 20 miles long and 0.6 miles (one kilometre) deep, but it’s not as quiet as it appears. Since 1978, the dome of this caldera has been growing steadily higher—an observation which suggests new magma is leaking into the reservoir, or that it’s entering into its final stages, with the recent uplift related to the expulsion of its last remaining stores of liquid magma. But these are theories. Prior to the new study, scientists weren’t entirely sure about the caldera’s exact physical characteristics, despite extensive investigations over the past 40 years; previous research revealed small geologic features at very shallow depths, and very large features at deeper depths, creating a blindspot in the mid-crustal regions. A new study led by Ashton F. Flinders from the US Geological Survey’s California Volcano Observatory in Menlo Park, California, is now offering the most detailed description of the Long Valley Caldera to date. The new research, published in the science journal Geology, suggests the reservoir contains over 240 cubic miles (1,000 cubic kilometres) of semi-molten magma. Of this total, approximately 27 per cent is in a liquid state—and thank goodness for that. At least 50 per cent of the magma within a caldera needs to be in a liquid state to facilitate a large-scale super-eruption, according to the researchers. Phew. Despite these words of assurance, the researchers don’t know how the melted magma is distributed within the reservoir, which could mean that “normal” eruptions, i.e. non-super-eruptions, remain a distinct possibility. As this latest research suggests, this volcano may not be as dormant as we’ve been led to believe. 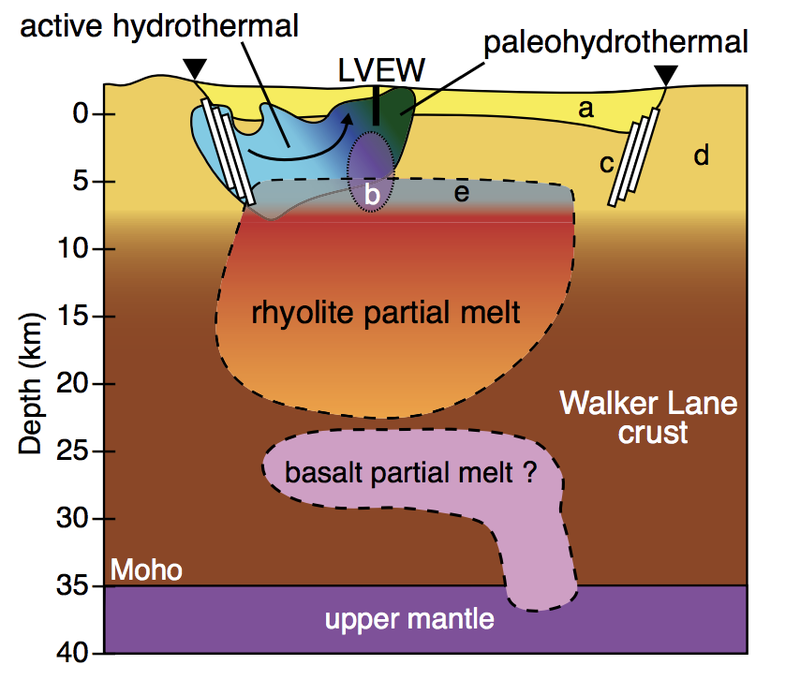 “While supervolcanoes like Long Valley are rare, understanding the volume and concentration of melt in their magma reservoirs is critical for determining their potential hazard,” the researchers write. Flinders and his colleagues performed this work by analysing seismic data collected for the past 26 years at locations within 95 miles (150 kilometres) of the caldera. 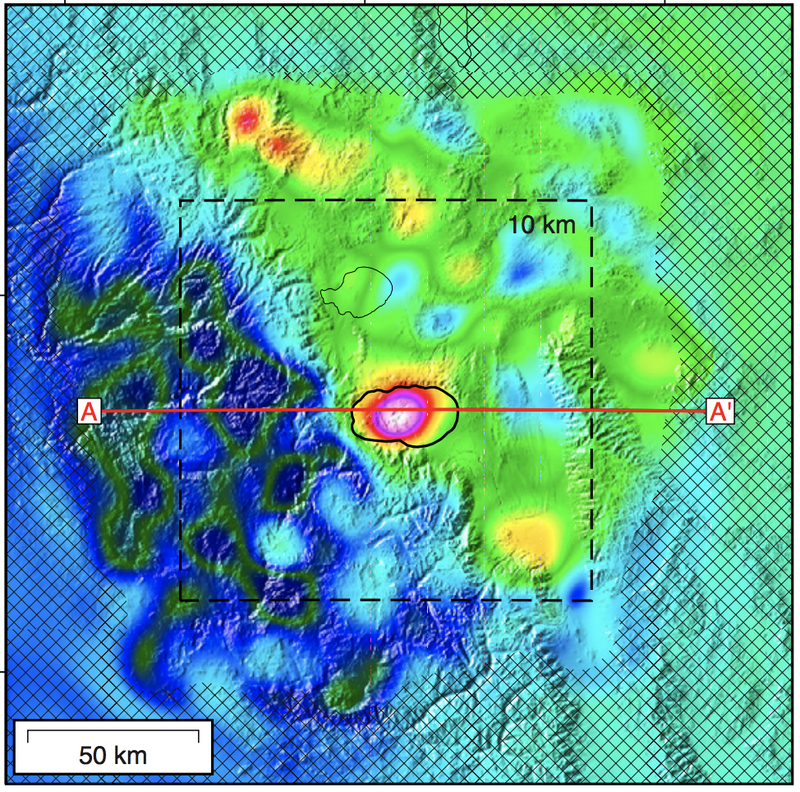 They calculated the shear-wave velocity of the caldera’s internal structure using the historical earthquake tomography data (a technique in which x-rays are used to display a cross-section through a solid body, like the Earth’s crust), where high shear-wave velocity indicated low amplification of seismic waves and low shear-wave velocity represented areas experiencing intense amplification. The lower the shear-wave velocity, the more fluid the material. Armed with this data, the researchers created a 3D image of the caldera’s interior, which they used to estimate the amount of molten and semi-molten magma within the chamber, including the 240 cubic miles of magma detected within a zone at the crust’s middle regions. As for the gradually rising dome, the researchers say it’s likely the supervolcano going through its death throes, as its magma stores slowly transform into solid rock and squeegee out the remaining lava. The Long Valley Caldera may still be capable of unleashing ordinary-sized eruptions, but nothing on the scale of what happened hundreds of thousands of years ago.